The Pine Bluff Locomotives were a minor league baseball team based in Pine Bluff, AR in the independent 1996 Big South League. Home games were played at Taylor Memorial Field. The Locomotives were founded by brothers Jeff and John Gross, who where president and general manager of the club, respectively. They also owned the club along with James Gray. The season was scheduled to begin on Friday, June 7th, but the opener was rained out. Instead, the Locomotives opened the season on Saturday with a doubleheader against the Greenville Bluesmen, winning the first game 17-4 and losing the second game 5-171. A total of 2,200 fans showed up for the doubleheader at Taylor Memorial Field, and decent attendance throughout the season followed. In all, Pine Bluff drew 35,693 for the season, an average of about 1,000 a game2. Only 26 games into the first half, manager Bob Lacey was relieved of his duties. On July 4th, Lacey ordered his team to forfeit a game in Greenville, MS, and following a team meeting, Lacey was let go. He was replaced by hitting coach Bobby Clark3. The Locomotives finished 2nd in both halves of league play, losing to Greenville in the semifinal playoffs. Starting Pitcher and pitching coach Les Lancaster won the league MVP and pitcher of the Year Awards after going 12-2 with a 3.03 ERA. 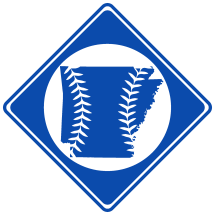 The following is list of Locomotives players with Arkansas connections. For a full list of all players, see Statistics.